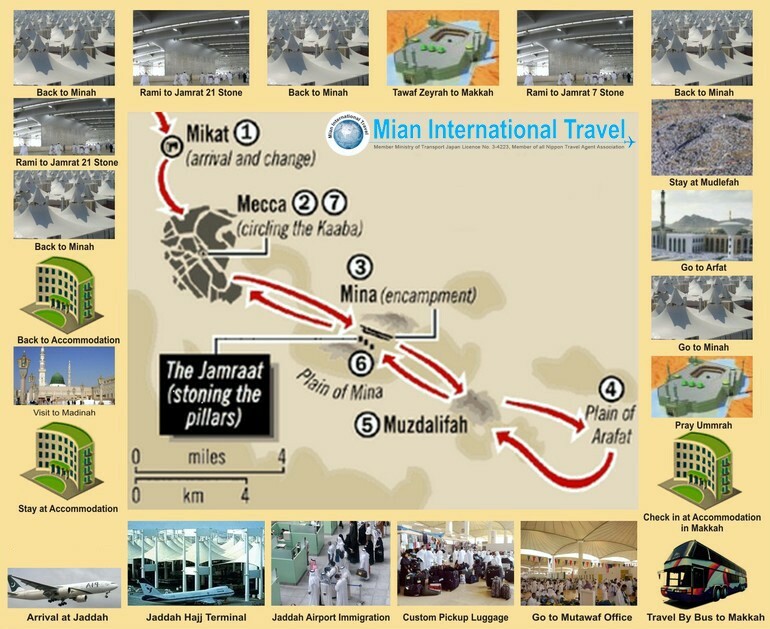 Mian International Travel offers two Hajj packages. A deposit of HK$ 15,000 is required for reservation. Hajj Package A with Hotel costs HK$ 38,000 and Package B with Furnished Apartment costs HK$ 34,000. Ticket Type Fix ticket - No date Change For more details, please contact us. Camps Tents are located in the South East Asia Enclave. Any cancellation received less than 45 days from departure is non-refundable. In case of missing the flight on departure day 100% non refundable. Air Ticket with all taxes included. Air Conditioned Transportation by Bus in Saudi Arabia. Five Days Food in Mina & Arafat and During Hajj Trip 3 time meal in Makkah and Madinah. Passport and residence card validity must be more than 6 month from 01 Aug 2018 with 2 blank pages of your passport. Copy Of Hong Kong Or Macau ID Card. Two recent passport photographs 4cm x 5cm size of with white background. The face must cover at least 70 to 80% of the space. Certificate Of Vaccination Against Meningitis(ACYW135) and Seasonal fluenza, Done not Less Than 10 Days And Not More Than 3 Years. Only Machine Readable Passports Accepted. Application are submitted directly to the consulate and the visa is granted free of charge. A copy of the applicant’s Hong Kong or Macau ID card for holders of foreign passports. 2 color photos with white background. Proof of relationship for the accompanying persons, such as birth certificates and marriage certificates. If the document is issued in Hong Kong, it must be endorsed by the high court and if it’s issued overseas, it must be endorsed by either Saudi embassy in the issuing country or the consulate of that country in Hong Kong or the Kowloon Mosque or the Incorporated Trustees of the Islamic Community Fund of Hong Kong. A return ticket or a ticket intended for travel to further destinations. Certificate for vaccination against Meningitis (ACYW135) stating that the vaccination of all adults and infants of the 2 years of age and above against this disease was done not less than 10 days and not more than 3 years at the time of application, and vaccination against seasonal influenza. Children's application will not be accepted. Visa will not be given to applicants who performed Hajj within the last five years. Application submission start date and availability of application forms will be confirmed in due time. After submitting the application to the consulate, Each applicant will receive an SMS with an individual code number. Log into the Ministry of Hajj and choose a package and pay it using a credit card. Upon successful payment, bring the receipts to the consulate. The consulate will execute and issue the visa. Aziziyah Place or Mena is 6KM away from Kaabah Sharif. So you cannot Pray your 5 Salah In Kabbah Sharif every Day. Our Accommodations which are very near in Kabah Sharif are most efficient and comfortable as it will take only 7 minutes by walk. Pray all your Salah in Kabah and other Ibadah in Kabah Sharif not in AZIZIYAH.